A graduate of West Chester University, Mr. DiDonato spent 30 years in public education. During that time, he served as Director of Bands at both the high school and middle school levels. He has had award winning school ensembles and musicians in many organizations under his direction. He has also directed several honors ensembles as well as the All Region jazz bands. As the conductor of those groups, he worked with then student musicians Adam Blackstone, Nick Marchione and Earl Phillips. Mr. D has been an active member of SJBODA, NJAJE and the Percussive Arts Society. 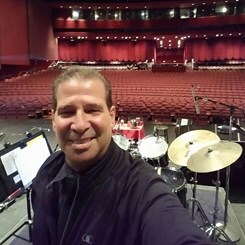 Mr. D has been performing in the tri state area for over 40 years. Ron has played drums with the Lakewood Jazz Ensemble, now Wilbur Wittemann Big Band, for over 28 years. During that time, Ron performed with great local jazz musicians such as John Allred, Kai Hansen and Bob Gravener. He has also performed with legendary jazz icons Arturo Sanduval, Clark Terry, Bill Watrous, Phil Woods, Louis Bellson, Bob Mintzer, Randy Brecker, Dave Wekle, Dennis DiBlasio, Wayne Bergeron and many others. Performing and working in clinics with many of those musicians was an invaluable experience and helped shape Ron as a musician and educator. He continues to share his experiences through his performances, clinics, lessons and adjudications. He is recently retired from public school education but continues to work with music students through his affiliation with Music and Arts as an instructor and through his clinics and adjudication of local jazz festivals including Cavalcade of Bands events. Request Lessons with Ron today!